Oil on canvas, 57 x 52 cm. Instead of depicting Rome’s magnificent and majestic churches from the inside, Wilhelm Marstrand depicted the harsh reality that took place outside the church’s walls in this painting. A group of emaciated beggars flock around a cardinal who hurriedly blesses them. The bright white colour of the cardinal’s robe stands in stark contrast to the dirty brown shades that make up the beggars’ more modest clothes. Furthermore, with his body language the cardinal signals his discomfort with the situation; his one foot is on the first of the steps to the church, and he appears eager to go back inside and leave the needy beggars outside. 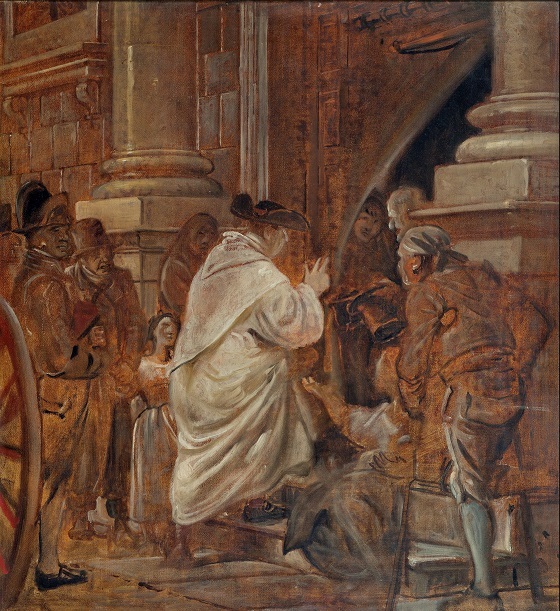 Marstand’s own sympathy for the light of the beggars and his critical perception of the Papal Church becomes evident by his depiction of the cardinal’s blessing as an empty, hurried and meaningless ritual.